There is a wonderful story that accompanies this recipe in Norman’s New World Kitchen. Many years ago, a housekeeper in Venezuela named Juanita was gastronomically light-years ahead of her time. She was a gourmet in a country that didn’t yet know the meaning of that word, inventing dishes so complex and delicious they would rival today’s hautest cuisine. One of the dishes she invented was this, and one of the people she taught it to came to work at Norman’s restaurant. When I first spied this recipe in the book it lept off the page at me, begging – no, demanding – to be made. It seemed to represent everything I look for in food: hearty, rustic character, bold, intriguing flavors, and of course that element of the unexpected – in this case in the form of chocolate. And really, what could be more New World than chocolate? If you’re a fan of Mexican food, for example, you no doubt will have tried mole, and chances are that the mole you tried contained chocolate. It’s a fantastically complex sauce to make, often containing a dozen different varieties of chile, some of them indigenous to specific parts of Mexico, along with nuts, seeds, herbs, dried fruits, onions, garlic, chocolate and bread. Although by the standards of what we normally eat it seems avant-garde, in fact it probably links us back to some of the earliest dishes human civilization invented, as nearly everything that goes into it was indigenous to the New World. Mole for me remains one of the great culinary mysteries, however, as I’ve tasted absolutely delicious versions in restaurants but never been able to replicate an edible version myself at home. I’ve always blamed my failures on the authenticity of my ingredients or the lack of patience to toast, grind, simmer and strain all those components properly. Perhaps that was another reason this particular recipe appealed to me so much: it had the most obvious characteristic of mole, namely chocolate, but the preparation looked like a summer breeze in comparison. I also knew its description would turn heads at the dinner table – and let’s face it, when you’re slaving away for hours in the kitchen, you might as well be making something that turns heads! But enough with the lead-in. It’s truth time. I followed this recipe to the letter. I browned, I caramelized, I braised and I simmered. I bought the best components I could get my hands on: dark, bitter Venezuelan chocolate, fresh Tahitian limes that I spent an hour squeezing… But honestly, I could barely eat the results. The duck was fine, delicious in fact – the braising method produced a succulent, tender, perfectly cooked leg that I would be happy to make again, and the long slow cooking of the onions and oranges produced a savory compote with a slight citrusy note that was incredibly tasty. But the chocolate sauce – really the component that ‘makes’ this dish – was awful, just all sourness and bitter, and it was so powerful that even a few cautious dribbles on the duck and onions threatened to spoil them too. Everyone at the table was polite and oohed and aahed, but when I asked if it was something worth making again there was a curious silence. Dear Norman, I’m sure you meant well with this recipe and I’m even more sure Juanita was an excellent cook, but maybe it will take a few more light years for our under-evolved tastebuds to catch up with her culinary genius. Preheat the oven to 300F/125C. Grate the zest from the oranges and set aside. Peel the oranges and separate the segments, discarding any seeds. With a sharp knife, score a crisscross pattern in the skin of the duck legs. Season with plenty of salt and pepper. Heat the oil in a large roasting pan over medium-high heat. When very hot, put the duck legs in (in batches if necessary), skin-side down, and let sear until brown (protect yourself from splatter!). Turn once and sear the other side as well, then remove to a plate and let drain on paper towels. Pour off the excess fat from the pan. Spread about half the sliced onions in the roasting pan and place the duck legs on top, skin side up. Scatter the garlic, leeks, celery, orange segments, thyme and bay leaves over the legs, and cover with the remaining onions. Pour 4 cups of the chicken stock over everything, cover the pan with foil, and place in the oven for 1 hour. After an hour take the pan out and stir the onions around. Re-cover the pan and place in the oven for another approximately 1 1/2 hours, or until the duck is fork-tender. During this time, stir the onions every 20-30 minutes, and I recommend taking off the foil for the last 40 minutes of roasting so that the skin crisps up nicely. While the duck cooks, make the sauce. Heat the reserved orange zest, sugar, orange juice and lime juice over medium-high until it boils. Turn down the heat slightly and let it simmer until the liquid is thick, amber-colored and coats the back of a spoon, about 40 minutes. Take it off the heat and whisk in the chocolate and the cream. Heat the remaining cup of chicken stock and gradually add it to the chocolate mixture, whisking constantly. Don’t let it get too thin – only add enough so that the mixture is smooth and glossy and coats the back of a spoon. dium-high heat on the stove top and cook until the liquid in the pan reduces to a thick glaze on the onions. Taste and adjust for salt. Add the legs back to the pan and keep warm until ready to serve. Whisk the butter into the chocolate sauce and add a little vinegar if it seems too sweet. 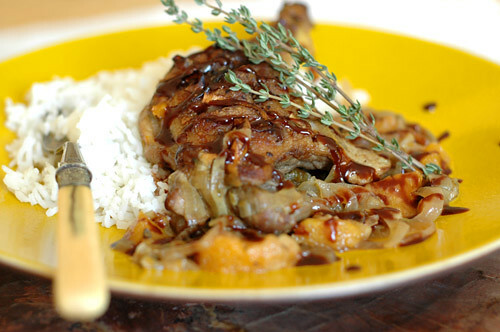 Serve the duck on a bed of the braised onions and drizzle with the chocolate sauce, with plenty of rice alongside. I don’t get it… 2 cups of sugar, plus all of the sugar in the juices and the sugar in the chocolate — this sauce sounds almost cloyingly sweet to me. Where did all of that sweetness go..? Hi Michele – I hope I haven’t let you down too much 🙂 I debated whether I should post about this at all, but I figured it can sometimes be as instructive to hear about failures as about successes! And it’s funny you mention hot fudge sauce, since that’s exactly the consistency it had – only imagine a very sour hot fudge sauce with a hint of chicken, and there you have it!Hi Adam – I also imagined it would be too sweet, but I gave Norman the benefit of the doubt. It actually tasted kind of like those candies that have a layer of citric acid on the outside, you know where your first taste is just mouth-puckeringly sour before you realize there’s any sweetness at all. I imagine that reducing the lime juice might be one step in the right direction, but then it probably *would* be too sweet. Oh well, many more recipes out there to be tried!Hi Daffy – welcome, and thanks for your kind words! It’s never easy to serve something to people that you don’t feel is up to your usual standards, but luckily they were all family so I hopefully don’t have to worry about this damaging my reputation too much 😉 At least we’ve all learned something important, namely that duck, chocolate and 1 1/2 cups of lime juice shouldn’t go within ten feet of each other! i had to say i was piqued to read the “orange chocolate sauce” part with duck – quite an unusual combination really. perhaps it could be an idea to substitute the extra dark chocolate to some sort of milk chocolate in order to take out the bitterness? It looks delicious–and I love Norman. I wonder what would happen if you used Mexican chocolate–the cinnamon in it might offset the bitterness. I would cut back on the sugar in this instance and do part sugar and part simple syrup. Thanks for sharing–you are a brave one! Hi Jeff! Nice of you to stop by! How is life treating you? You know, cooking in halls of residence was mostly a pain in the neck, due to the lack of fridge space, temperamental ovens and pans that went mysteriously missing, but there is something I miss – having lots of starving friends to feed ;)Take care!